Well once again I was temporarily stumped on the why of commercial renaming of gems and minerals. Today I am writing about Chrysotile. It will be rare, but not impossible, across the web to find it named as such though. 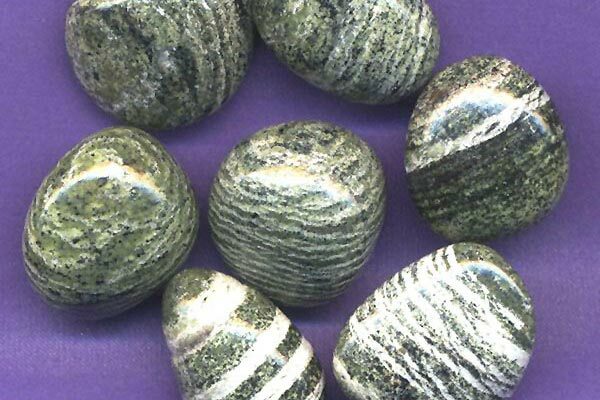 Now, if I said Green Zebra Jasper, or Lizard Skin Jasper, or Dragons Scale Stone, it might ring a bell. Do I hear a hmmmmm, followed up by a heavy sigh… and then a really? Well, yes. And after doing some research, I think I understand the why on this one. Would you buy something that had asbestos in it? Mmmmm, probably not. And while I am showing it, I am opting to NOT sell it. While I have not found evidence of health risks from just handling the tumbled stones, for those who like to plop them in water and drink it, well hey, I am not going to contribute to that. I have no clue how harmful it may or may not be. After all, at one point we didn’t understand how harmful those ceiling tiles or brake linings would be. I just can NOT go there with this one. The one characteristic I noticed when first unpacking these was how the white stripes didn’t polish up. I thought it was kind of cool. Nice tactile difference between the green and the white. Loved the patterns. I was a bit curious as to what made up the white powdery stuff that I could easily rub off (noticeable in the photo). As I started to read about the actual make up, I got up, washed my hands and sealed the bag up. Now I am trying to figure out what to do with the kilo of them sitting on my back porch. Chrysotile has a monoclinic crystal system and is a member of the Serpentine Group. Ahhh, there’s where the green coloring comes from! It is VERY soft at 2.5 on the Mohs Hardness scale. While some of what is on the market right now comes from Poland, most is coming from mines in Quebec, Canada. I think in our quests for new and unique gems to work with, knowledge is our best friend. It saddens me that the marketplace seems flooded with quite a bit of this one. It seems to me this is one that should come with a disclaimer of some sort. People really do not know or understand what they are purchasing. So, MY best advice? If you want a great stone for working with the Crown or Heart Chakra, it is my personal opinion that you could make much wiser choices than this particular one. Like a straight up Serpentine, no asbestos and all the love! Again, while I could not find specific medical findings, it does not mean that there are not adverse effects. So, why chance it?